Heat oven to 400°F. Bake chicken nuggets as directed on package. Meanwhile, cook and drain fettuccine as directed on package. Leave fettuccine in colander after draining. In same saucepan, heat tomatoes and tomato sauce over medium heat, stirring occasionally, until thoroughly heated. 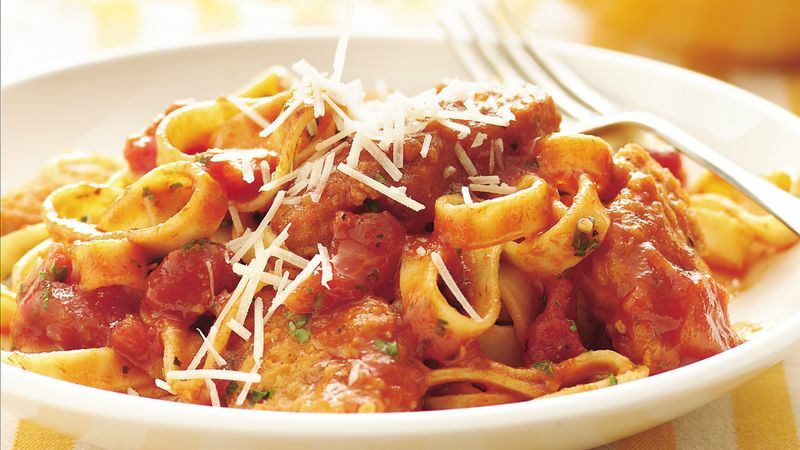 Add fettuccine, chicken and parsley to tomato sauce; toss to coat. (If desired, cut chicken nuggets in half.) Sprinkle with cheese. If you've purchased breaded chicken breast fillets instead of the nuggets, go ahead and bake them, then cut into pieces just before tossing with the fettuccine. Refrigerated pasta cooks more quickly than the dried variety, so follow the directions on the package carefully.